Photos from Apollo 17, courtesy of NASA. I am a child of the age of moon landings. From the time I was a small boy I watched manned space launch after launch, each building on knowledge gained in the previous flight to realize President John F. Kennedy’s goal of landing a man on the moon by the end of the 1960s and returning him safely to the earth. 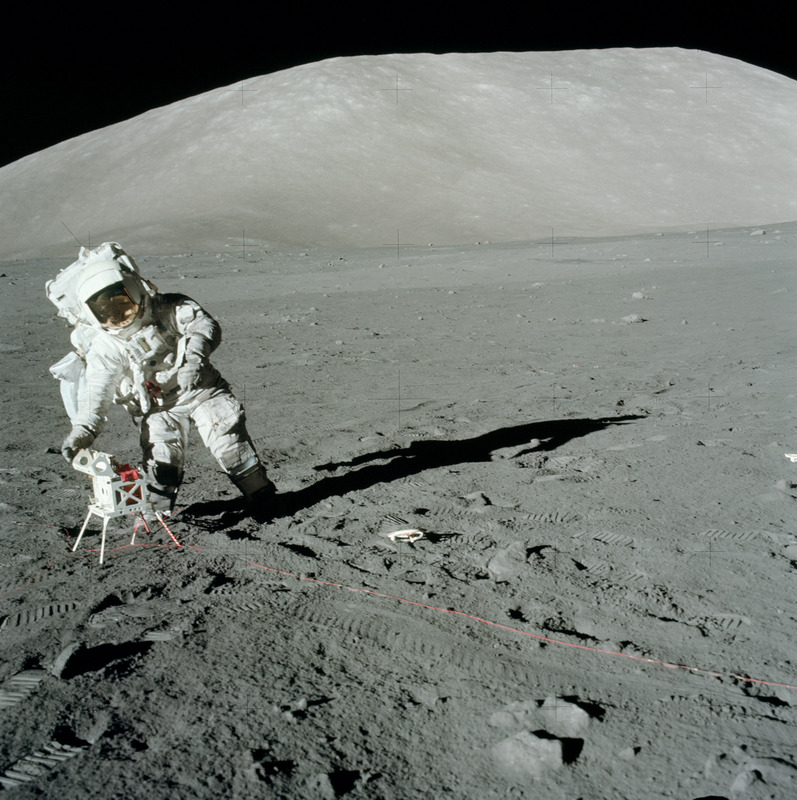 It’s what I saw for myself, not as one who would put the first footprints on the moon, but as part of the second tier of lunar explorers who would build bases, map geology, build lunar telescopes and conduct a variety of scientific experiments. Near the middle of my sophomore year in college, in 1972, Apollo 17 became the last manned spacecraft to land on the moon and explore. 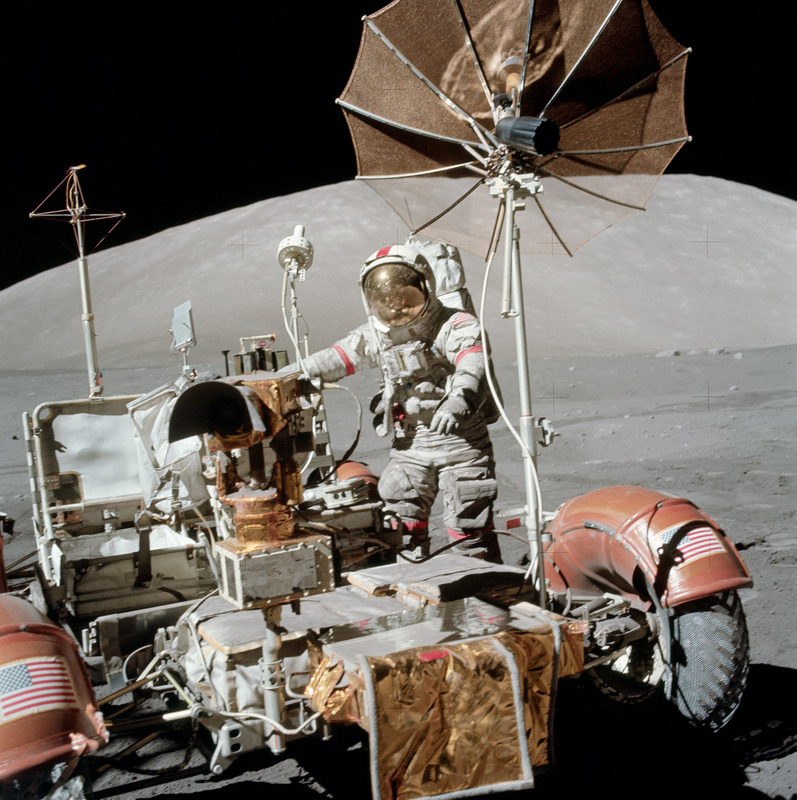 The final three lunar missions in particular had been rich sources of scientific treasure. Each used a moon buggy to expand the range astronauts could explore. Each landed adjacent to significantly interesting geological features. And each featured multiple, long duration moon walks conducted over several days. While all of the landings of the Apollo program had been of great interest to me, these last three seemed especially interesting, especially for the images brought back. As they had since Apollo 11 landed in the Sea of Tranquility in 1969, each of the astronauts wore a Hasselblad camera strapped to his chest with large controls that could be manipulated with the gloved fingers of a space suit. 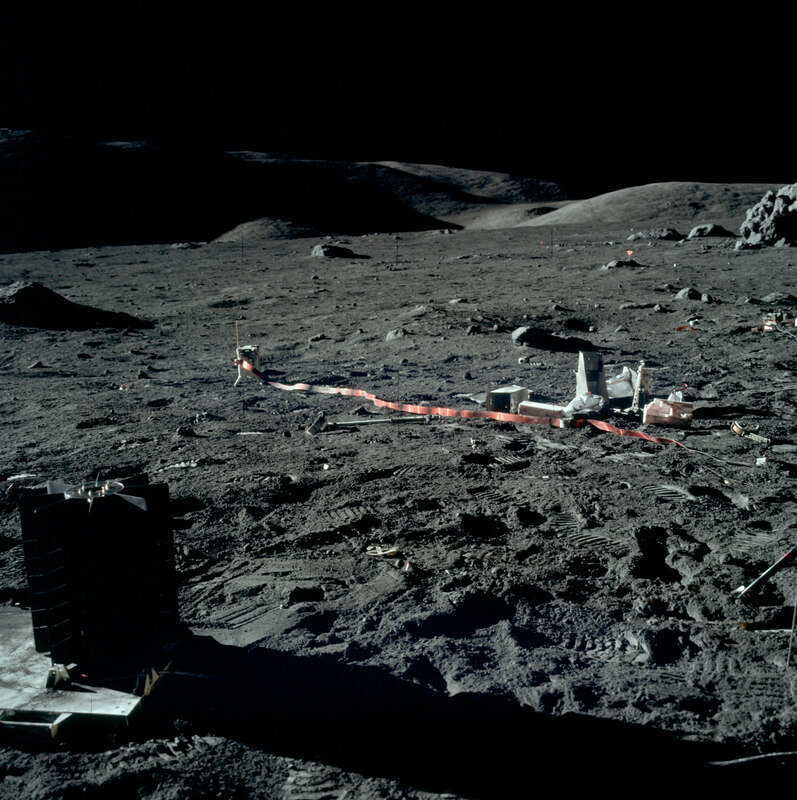 The astronauts documented their activities, photographing everything from the rock samples they picked up to the terrain around them. Often they would shoot frame-by-frame panoramas to give an expanded view of their surroundings. 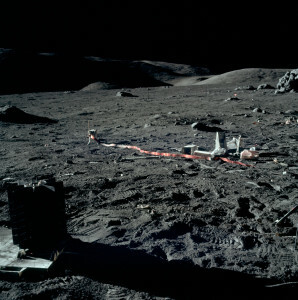 All of these images, from boot prints in the lunar soil to instrument arrays, astronauts working and assorted gear became a source of fascination as I studied geology at the University of Arizona. 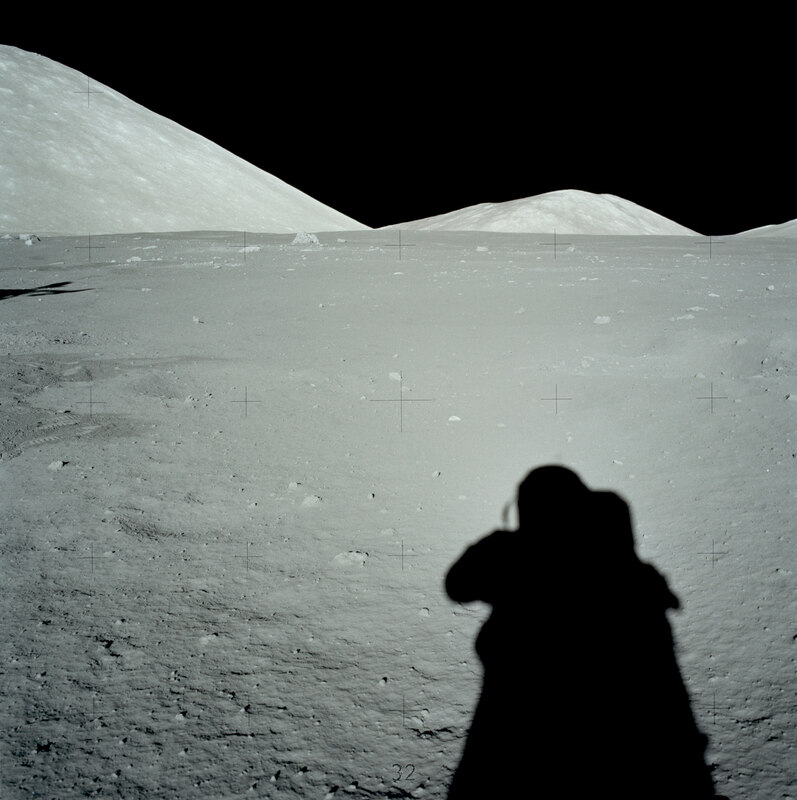 And since astronaut Harrison “Jack” Schmidt of Apollo 17 had himself been a geologist, I figured it would just be a matter of a few years before we would be ready to do more ambitious work on the moon. As it was, Apollo 17 would be the final mission to the moon, even though three more Apollo spacecraft had been purchased and built. I was 19 when that final moon landing took place, and at just over 60 I find myself envisioning a new photographic series to explore the the areas where Apollo astronauts trained in the southwest U.S., along with the desert around Tucson, Arizona, as though I was an Apollo astronaut. I am calling the project Apollo 18. Over the next few years I will carefully study the photos from Apollos 15 through 17 and formulate the kind of shots I should take, as well as how many locations I should set out to visit. I will try to mimic the light angles as well as the subject matter of the Apollo era. By June, as the sky contains the fewest clouds of the Tucson desert year, I should be ready to start shooting. ~ by Daniel Buckley on March 14, 2014.